Apocalypse Knights, developed by InterServ International, is a free action game where you are charged with the quest of taking back the land from all manner of dark and deformed creatures. Playing as a sort of futuristic knight, Apocalypse Knights takes place in 2050, where you get to face-off against demons released from the melted Arctic and Antarctic ice zones. The demons will come at you in waves, but you’ll be able to see them coming thanks to little red indicators around the screen that point out where they’ll be coming from next. 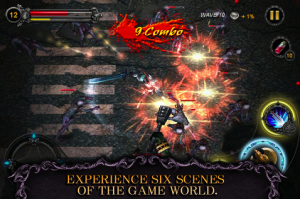 With 10 levels of difficulty, 6 different scenes, and many kinds of monsters, there’s plenty of action in Apocalypse Knights to keep your adrenaline pumping. 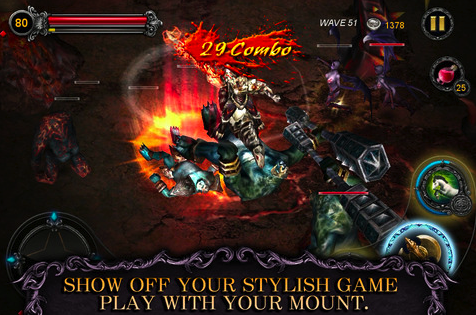 The developers state explicitly that they strongly recommend you enjoy the ultimate gaming experience on iPad 2 or above. 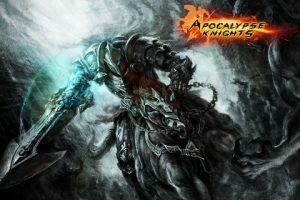 Apocalypse Knights looks and plays great on the iPad 2, but it’s also surprisingly agile and smooth on my iPhone 4S. 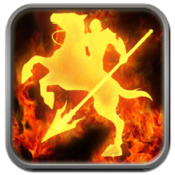 Regardless of which device you choose to play the game on, Apocalypse Knights has great visual appeal, but also has great audio appeal as well. There’s a sort of thumping, semi-electronica soundtrack, punctuated frequently by the grunts of your character as he hefts his massive sword over his head and takes a swing at the legions of the undead. It perfectly suits the atmosphere of the game. 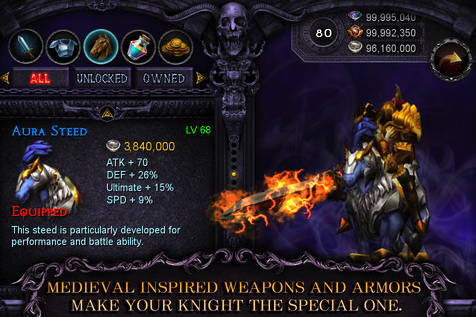 Beyond the hack and slash fun, it’s worth sticking with Apocalypse Knights to get new weapons. Each weapon has a unique ultimate skill, so collect as many weapons as possible to see all the cool moves your character will bust out. With responsive controls, a great, adrenaline-pumping atmosphere, and graphics that look equally good on big or small screens, action fans are sure to dig this classic example of slashing fun. Apocalypse Knights may not be particularly innovative, but it’s sturdy and pretty addictive. Apocalypse Knightsis compatible with iPhone 3GS, iPhone 4, iPhone 4S, iPod touch (3rd generation), iPod touch (4th generation) and iPad. Requires iOS 4.2 or later.